Dex, I think it's about time we started pleaching. But you don't even know what I'm talking about! It is dangerous and hazardous to play with toxic chemicals and I am surprised you would suggest such a thing. Oh brother. 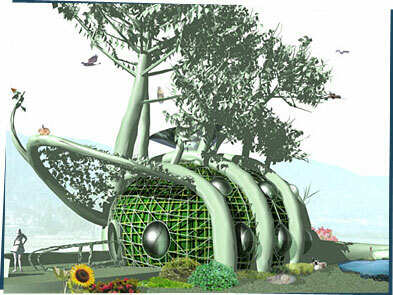 Allow me to introduce you to a fabulous concept — grow your own house! Pleaching is when you grow trees with branches that naturally weave together. You weave the trees together to make walls! There's this guy called Mitchell who has designed tree houses — they are literally made out of trees! He calls them Fab Tree Habs. He started a non-profit organization called Terreform — check it out to see their crazy-cool designs. Dwell's web site shows some cool examples of arborsculpture. Tell us what you think about using living trees to build houses.